I am currently working with a wonderful shop called After Noah, through The Blogger programme (if you are a blogger I would suggest signing up). All of the items in this post were sent to me by After Noah but this does not change my opinions of the shop/products, for more information see the PR tab. I instantly fell in love with the gorgeous gifts, home ware and stationary on After Noah's website. Here are some of my favourite picks from their website as instant gifts for men and women. 1. 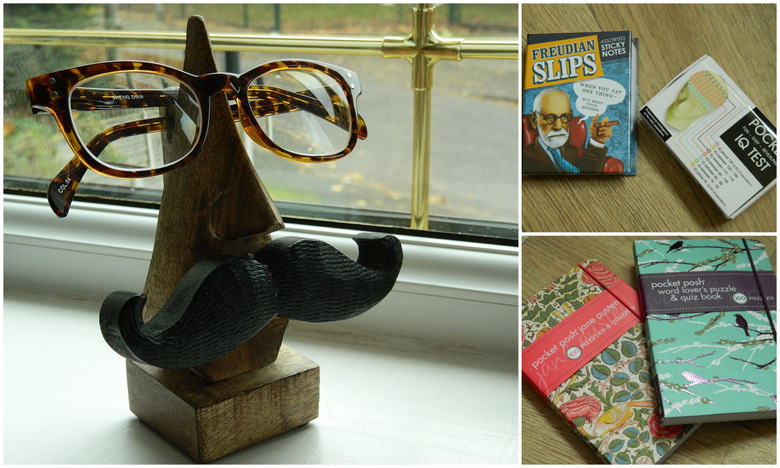 *Wooden Moustache Glasses Holder (£14): I saw this on the main website page and I instantly loved it. I think this unique, quirky glasses holder would be great for men or women as moustache themed items are really popular right now. I love this glasses holder , it is so practical and a great home ware item too. Great for numerous ages. I know a lot of my male as well as female friends/family who would love to receive this as a Christmas gift! 2. *Freudian Slip Sticky Notes (£6.50): Some of you may know that I graduated this year with a BSc psychology degree so I couldn't resist these cute Freudian sticky notes. I think this would make a fantastic gift for those interested in or studying psychology. 3. *Pocket IQ Test (£6): A great gift or stocking filler for the brainics you know! It is a small set which would be great for those who travel or for students. Not only do they get a great gift but if they have a high IQ score, they get the bragging rights too! 4. *Jane Austen Posh Pocket Book (£5.99): Do you know a Jane Austen fan? Then this is a perfect gift, it contains 100 puzzles and quizzes all about the one and only Jane Austen. The packaging/design of the puzzle book is just gorgeous, I love it, it looks a lot more expensive that it actually is. 5. *Word Lovers Puzzle and Quiz Book (Posh Pocket Books) (£5.99): Another posh pocket puzzle book and another gorgeous cover design, in terms of looks, these posh puzzle books are fantastic. This one contains crosswords, quizzes and lots of other puzzles. I think it would be great for those who travel a lot or maybe aunties or grandmas etc - my mum would love these puzzle/quiz books. There are my picks of the amazing, unique gifts for men and women at After Noah. I would definitely recommend these gifts - click here to view more items from After Noah. oh wow that glasses holder is hilarious! Those books look so great! I love the glasses stand! So cute. The Freudian slip sticky notes sound really cool too, although Freud and I are not friends... Haha. That glasses holder is super cute! Okay that glasses holder is the BEST idea ever, very tempted to by one for myself and my boyfriend! Such cute gifts! I love things that you can tell are Different, not something you would pick up in say, Boots.